Once per turn, Huang Gai can discard a card and lose one health. For each unit of health that Huang Gai loses, he draws three cards. If it is during his turn, then Huang Gai's red attacks have unlimited range and cannot be escaped for the rest of the turn. He can also use an additional attack that turn. Huang Gai can discard equipped cards to use "Bitter Meat". 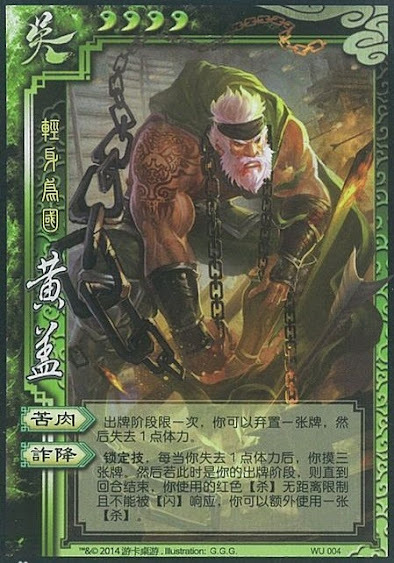 If Huang Gai loses health outside of his turn, he still gets to draw three cards. He does not get the benefits to his attaking though. If Huang Gai loses multiple units of health at once, he draws three cards for each unit. When Huang Gai is damaged, he does not draw any cards. He only draws when he is losing health.